Trust Carol to ask around at the hotel to see where the locals eat and end up finding a gem of a place. Flying Fish is one such place. Imagine a place that you can eat a MUD BUG? Ever eaten them? Imagine> ? a Bug>? I have, though not tonight. They are crayfish or as I was raised, crawdads. They really are more bugs. We all had great food with great ambience along with their wall of Basses--and a sort of friendly bunker interior. Just perfect. Way more perfect than any white table cloth place. The grilled food was beautiful. I had catfish which was perfect and M. contented himself with a lovely plate of crab legs. And, nothing was going to break the bank. The minute you walk into Flying Fish, you know owner Shannon Wynne has spent a lifetime of weekends at the lake. 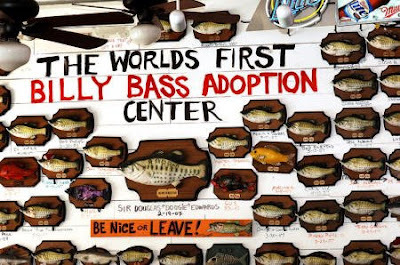 The inside of this busy seafood joint carries the vibes of his favorite catfish shack and a well-loved lakeside cabin, as the walls are covered with bass and other fish trophies. There's even a marina element, with a big vintage Evinrude sign dominating one wall. Wynne -- who grew up fishing at the lake on his family farm but now has his own place on Caddo Lake -- found plenty of Cowtown pals who share his fixation on relaxing waterside escapes: At eye level alongside the booths are photos of Fort Worth folk with their own fishing tales attached. Apparently, everyone in town has caught the fish fever, too, judging from the crowds that spill out on the porch every day at noon and for the dinner hour. The only way my gang has been able to eat there in under an hour is to go either before the lunch rush or after the supper crush. --see, can't Carol pick em>? Top drawer!